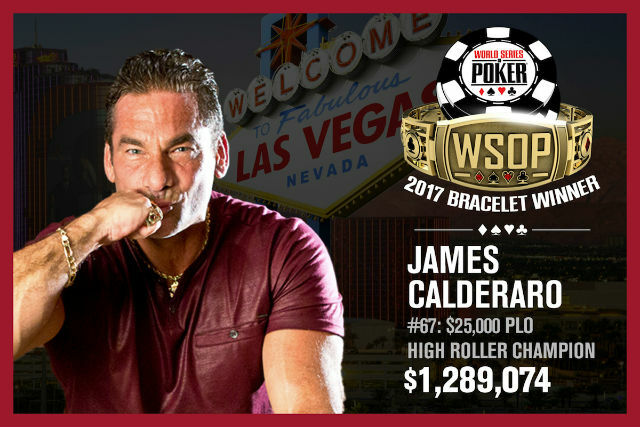 In 2017, James Calderaro took down the $25,000 Pot Limit Omaha event at the WSOP. For many that enjoy the very good, some may say “great”, game of Omaha, finding some of that four-card, high variance action can be a challenge. Sure, there may be a semi-regular cash game in a local card room and, on occasion, a smaller tournament to take a shot in but for those that truly love the perennial up-and-coming poker variant of Omaha there’s no better time to be a fan of the game than the summer. And no better place to get that fix than Las Vegas during the World Series of Poker. In recent years, the WSOP itself has increased the amount of Omaha offerings. Player pools have shown that its popularity is still on the rise. But the Rio isn’t the only place in Las Vegas a player can find a great Omaha tournament. All of the biggest summer series have Omaha tournaments of all different variants. Fans of Omaha Hi/Lo, 8 or Better and of course, Pot Limit Omaha all have plenty of opportunities to play for big money in Sin City this summer. A determined player could (practically) play some form of Omaha every day – sometimes twice a day – during the summer. Here are some highlights that the Omaha fanatic just has to check out. Following in the footsteps of the multi-day, lower buy-in NLHE GIANT, officials at the WSOP have decided to roll out a similar tournament for Omaha. The $365 Omaha Giant has five starting flights with unlimited entry, one on each Sunday over the course of the series (June 3,10,1725 and July 1). Each starting day will see play down to the money. For those that bag, Day 2 resumes on July 2 with the conclusion the very next day. If a player goes bust, they can re-enter another flight. However, if one has chips to go to Day 2, they are prevented from playing a subsequent starting day. Last year, the No Limit Hold’em version of the GIANT brought in over 10,000 entries and awarded nearly $300,000 for first place. While this year’s PLO GIANT is unlikely to hit that high mark, for the winner it will be one of the biggest bang-for-your-buck Omaha tournaments of the summer. If you think four cards produce more action, try getting five. That variant is called Big O and, yes, there’s a couple times during the summer you can give this a shot. Players looking to give it try for the first time may decide to head over to the Golden Nugget for their Grand Poker Series on June 5 for a modest $250 Big O tournament. If that goes well, one can reinvest their winnings two days later as the Venetian Deepstack Extravaganza on June 7 offers a $600 tournament. The climb to the Big O mountaintop summits with a $1,100 tournament on June 15 during Planet Hollywood’s Phamous Poker Series Goliath. There’s plenty of high-stakes Omaha action to be had this summer as well. Of course, there’s the World Series of Poker $25,000 Pot Limit Omaha 8-handed High Roller on June 20. As well as a pair of $10,000 Championship events on June 3 ($10K Omaha Hi-Lo 8 or Better) and June 23 ($10K PLO 8-handed). The WSOP also has seven other Omaha tournaments with a $1,500 buy-in or greater. This includes a post-Main Event $3,000 PLO 6-Max on July 8. The Venetian has a pair of $1,600 Omaha events on June 1 (PLO MonsterStack 8-Max – a 3 Day event) and June 10 (PLO 6-Max). Planet Hollywood also gets in on the action by providing a $3,000 PLO High Roller 8 or Better on June 21. If you follow the Omaha fanatic schedule you’ll see plenty of the Rio, Venetian, Planet Hollywood and the Aria, which has five $470 Omaha events spread throughout their schedule. But the Wynn’s Summer Classic Schedule only has one event in which you can play four-card poker in their beautiful property. So, if you’d like to make it to the Wynn, circle June 13 and hop in their lone $550 PLO tournament. That is, if you aren’t tempted by the $600 PLO 8 tournament happening at the Venetian on the same day at roughly the same time. So Omaha fiends here’s a schedule that will keep a player in action throughout the entire summer.